When did you first hear about the Italian Academy of Cuisine? I knew about the Academy for a long time. My parents would go to Vicenza and some of their friends, who were part of the Vicenza chapter, would invite them to go along to the convivi as dinner parties of Academy members are called. I can remember them telling me about one dinner in particular and about a man called Giovanni Capnist, who was from Vicenza. I don’t really know much about him but he was head of the Vicenza Delegation and at that time had written a book on mushrooms [I funghi nella cucina Veneta, 1984]. I had met him with my parents and I remember him telling me that he had been to Australia and that we have so many edible mushrooms here, ones that nobody really knows about. But to get back to your question, it was back in the mid-80s that I first heard about the Accademia through my parents going back to Vicenza. How did the Academy start up in Melbourne? Again, it was because of Giovanni Capnist. He wasn’t only Delegato of the Vicenza chapter, he was also president of the national body, which has its headquarters in Milan. It was a couple of years after that trip back to Vicenza that Capnist approached my father, Carlo Valmorbida, to head a delegation here in Melbourne. My father gave it some thought but was very involved in his business and graciously declined the offer. But he said to Capnist, ‘Why don’t you ask Luigi Di Santo [of Enoteca Sileno]?’ Capnist did and Di Santo accepted and so the first delegation of the Accademia Italiana della cucina in Australia was formed in Melbourne in 1989. What does it mean to be a member of the Italian Academy of Cuisine? Every year a book is published by the headquarters in Milan, which is not a restaurant guide. The Accademia does bring out a restaurant guide, both online and in print, and a monthly magazine to which delegates from around world contribute reviews of restaurants as well as reports and ratings of their convivi (members’ dinner parties). But that’s not what I am talking about. The book I’m referring is called “The Carnet”. It has details of every member of every delegation around the world. There are 218 delegations in Italy, 78 delegations outside of Italy, and over 7,300 members worldwide. So, lets say you go to Chile and want to go to an Italian restaurant there. Well, you can get in touch with a member in Chile and they’ll advise you where to go. Or, lets say you are in New York, you can ring a delegate there and ask whether there is an Accademia dinner planned while you’re there, and if there is, then you’re invited. What this means is that if you’re a member in Melbourne, then you’re also a member worldwide. I got involved because of another president of the Accademia, Prof. Giuseppe Dell’Osso, a surgeon, who came out to Melbourne with his wife. As a friend of Antonio Zeccola [Palace Films], who was president of the Melbourne delegation at the time, I was invited to a dinner Antonio had at his house to meet him. This president in turn invited me to come to a convivio at Florentino’s the following night. I went along to that and sat next to him and he was a very charming man. He too knew Giovanni Capnist well. Then he asked me, ‘Why aren’t you a member?’ That was when I decided to become a member. After a few years Antonio asked me to be his vice president. And you then took over from Antonio Zeccola? No, when Antonio felt it was time for him to resign as president, I was happy to stay on as vice delegata while someone else took up the role as president as I was too busy at work to devote a lot of time to it. After that Miro Gerjia became the Delegato for a number of years. When Miro left and I became Delegata, it was becoming more and more difficult to get people to attend our convivi and I felt that it was necessary to add a little more to our dinners and not necessarily make them all fine dining experiences as they can be so limiting and boring. For example, a few years ago I was staying with friends at a villa in the countryside near Florence, and there was a restaurant up in the hills not far from our villa, which was recommended to us by the delegation in Florence. We drove up there and we were really surprised because this restaurant was basically a baracca [a shack] with a few tables. Yet we had a really great meal there. The meat was beautifully grilled, and the vegetables were all seasonal and cooked perfectly. Everything was cooked in the style of ‘cucina povera’, just as the locals would have cooked at home. I’ve tried to include smaller family-run restaurants, pizzerias, and dinners at the local Italian clubs as well as fine dining establishments in the convivi we’ve had recently. I’ve noticed that the events have grown in popularity since you took over. There have been at least three dinner parties that I could not attend because they were fully booked. There was a period of limbo after Antonio resigned where it looked like we were begging people to come to our dinner parties, but now we’re actually turning people away. People are ringing me asking if they can bring friends along, and that’s great because it’s about getting new members and if you get new members then they invite more people. How do you decide where to go or what theme to do? There is a group of consiglieri to which I send an email asking for suggestions for the coming year, asking if they’ve been to any interesting Italian restaurants. They offer their suggestions and I usually go out and try these restaurants, and then I‘ll just organise the evening. The problem I find sometimes is that I’ll go to a restaurant and I’ll have an entrée, main course, dessert and a bottle of wine and it might cost me $100, but when I approach the restaurant and say I’ve a group of people who want to come, all of a sudden the three courses become five or six and $100 becomes $180. That irritates me. I can understand that the restaurants want to showcase the best food on their menu, but that food is usually the richest and most complicated and can be a too expensive and too much to eat. I also find sometimes that no restaurateur wants to give you vegetables, even a salad, yet most great regional Italian cuisine is based on using and cooking fresh vegetables. I would love to organise a convivio at a vegetarian restaurant, or at least one that bases its menu on vegetables. It’s not that the Accademia shuns hauté cuisine but, as I said before, we can have a convivio in a baracca and I don’t care, as long as the food is good, genuinely Italian and it’s a good experience. In your view, what is the Accademia about? For me it’s mostly about education otherwise all we are doing is just going out to dinner. I think it’s important for the Accademia to be critically appreciative but not to denigrate the restaurants we attend. 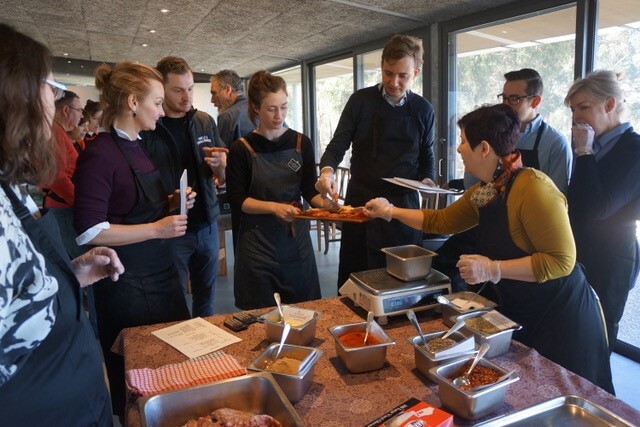 Everyone in Australia loves Italian food, so for me it’s about putting together programs where restaurateurs are given feedback that help to raise the bar a little bit, and members learn more about regional specialities, and it’s about keeping traditional Italian food and wine alive around the world. The Accademia has to offer more than just going out to dinner with a group of people. If you want people to belong to your events, if you want the people who have come along once to come again, then you have to offer something they can take home, such as a recipe, an experience and some know-how about the food they have eaten. What are some of the events planned that reflect the direction you’d like to take the Accademia? Well, a salami and salsicce making event is always good, and for this year we are going to Costante in Preston. it’s a great shop with all the bits and pieces for salami and sausage making, wine making, pasta making, and for making pizza. It’s a fascinating place. And at the back they have a room cued up for making sausages and salami. 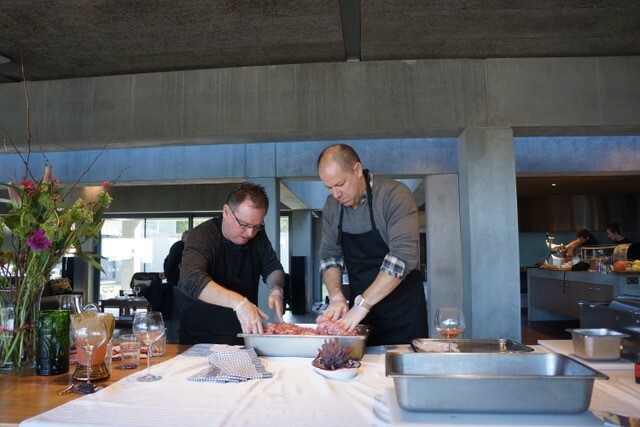 I went there and did the salami-making course and it was great. Another event I’m about to organise is one on Italian cheeses and salumi. I’ve met a local importer of fine Italian cheeses and salumi and he also wholesales the best locally made products. He runs cheese and salumi appreciation classes. I would like him to come as part of an Accademia dinner, so that we taste and listen to the origins of the food and how they’re made and where they come from: have the salumi as antipasto, have a main and then follow with cheese tasting, and with accompanying wines. Of course, it’s impossible to do these types events all the time, but people love it when you do, because they’re learning something as well as having a great dining experience. I’ve also been asked by our local group to organise a tour of Italy, incorporating dinners with delegations in the cities we visit. We’d be able to taste local food and meet with people from all over Italy. It sounds like a wonderful idea, but a lot of work!